Tonight I watched the PBS Special Dudamel: Conducting a Life in which Tavis Smiley profiled the young, charismatic Los Angeles Philharmonic conductor Gustavo Dudamel, a product of the very successful Venezuelan program “El Sistema” which exposes impoverished children to classical music. The program looked at the broader issue of music education and its role in education reform. We previously featured the program known as El Sistema, a classical music program in Venezuela transforming the lives of at-risk youth through classical music. This video features OrchKids, a program of the Baltimore Symphony Orchestra modeled after El Sistema. This 60 Minutes segment with Bob Simon should be mandatory viewing for any school or jurisdiction considering budget cuts to music education. A program known as El Sistema (The System) and The Simon Bolivar Youth Orchestra are a model for turning around poverty-stricken children’s lives and giving them hope. It’s noteworthy that Bob mentions specifically “Confidence and Self-Esteem,” which we identified as one of the 9 common lessons of music education that translate into success in my research. 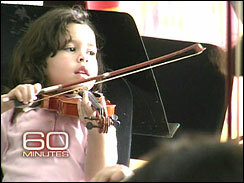 An interesting program that introduces classical music to students in Baltimore schools.